The following companies were featured on the Supporting Green Companies Facebook page last week. 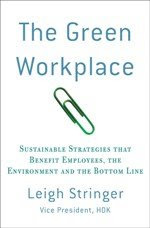 (Supporting Green Companies is sponsored by The Green Workplace blog). If you want to send any of these companies a message of support, "fan" them on Facebook now! Ice Stone: IceStone makes a range of products--slabs for wall coverings and flooring in addition to countertops--from 100% recycled glass that is mixed with cement to create a highly durable, aesthetically beautiful and green concrete surface. Their factory uses day lighting, graywater recycling and soy based machine lubricants and will recycle 2.6 million pounds of glass in 2006. Clif Bar & Company: In 2001, Clif Bar & Co. hired a staff ecologist and began working to reduce the company's environmental footprint. Among the changes: shifting to organic ingredients, eliminating shrink-wrap (that saved 90,000 pounds of plastic and $400,000 annually), and supporting a wind farm to offset fossil fuel usage. New Belgium Brewery: Looking for a better brewski? Try a New Belgium beer. It meets all its energy needs through a combination of wind power purchased from the city and cogeneration of thermal energy from the brewing process. The company recycles or reuses 98 percent of its waste stream--converting spent grain into cattle feed, for example. Frog's Leap Winery: In 1988, Frog's Leap became the first Napa winemaker to have its grapes certified as organic. Today, Frog's Leap produces 60,000 cases of wine a year, all from grapes that are grown organically. Perhaps more notably, they are grown with water-saving dry farming methods. In February of 2005, the winery essentially “flipped the switch” becoming 100% solar powered. Seventh Generation: Not only does Seventh Generation have products that are squeaky green, they also offer their employees interest-free loans (up to $5000) to become more energy efficient and reduce their carbon footprint. These loans can be used towards the purchase of fuel-efficient cars or for home improvements. G-Diapers: Thanks to one of our fans for suggesting gDiapers as a company to support. You must go to their site and watch the video to really understand how this works (http://www.gdiapers.com/gdiapers101/watch-the-videos). Basically, the diapers are made up of a cute washable "shell" with compostable/ flushable inserts. Karen millen Variety is really along with your period on your own as well as your site visitors!